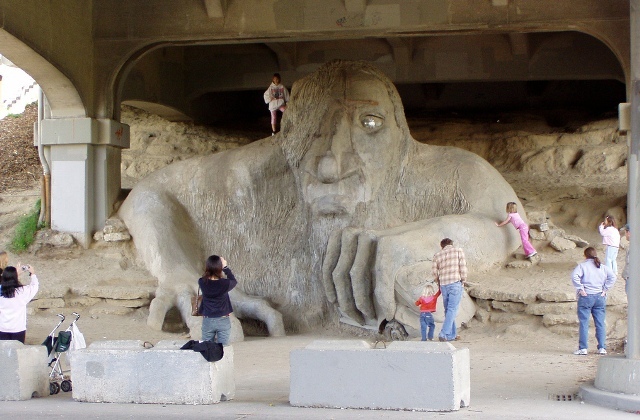 Fremont’s Troll is visited by a seemingly endless stream of pilgrims arriving in cars, tour buses, and even amphibious troop carriers (really). The Neighbor’s of the Troll worked for years with Seattle DOT and the Department of Neighborhoods on a Large Project Fund matching grant to install traffic circles, curb bulbs and a round speed bump to slow traffic on their narrow street. Their match requirement was easily met with volunteer hours and cash donations from the Fremont Neighborhood Council and the Fremont Chamber of Commerce. Interesting tidbit – The contractor dug up old rail ties from the long-gone trolley under Woodland Park Ave.
We were the fiscal sponsor for this project.